Product code: ES6712 Categories: Sold Items, Sold Jewellery. No matter how it is worn, this antique rose gold Albertina from the 1880’s is just so beautiful and elegant and is sure to always be admired. Albertina’s, also known as Leontine’s, were actually designed to hold a ladies pocket watch at one end and secure it to an outfit, however today they are more commonly worn as bracelets that look so beautiful on the wrist, or attached to a chain to wear around the neck which is another option. The colour of the rose gold is just divine and looks so beautiful on the wrist and the design is destined to always be admired. 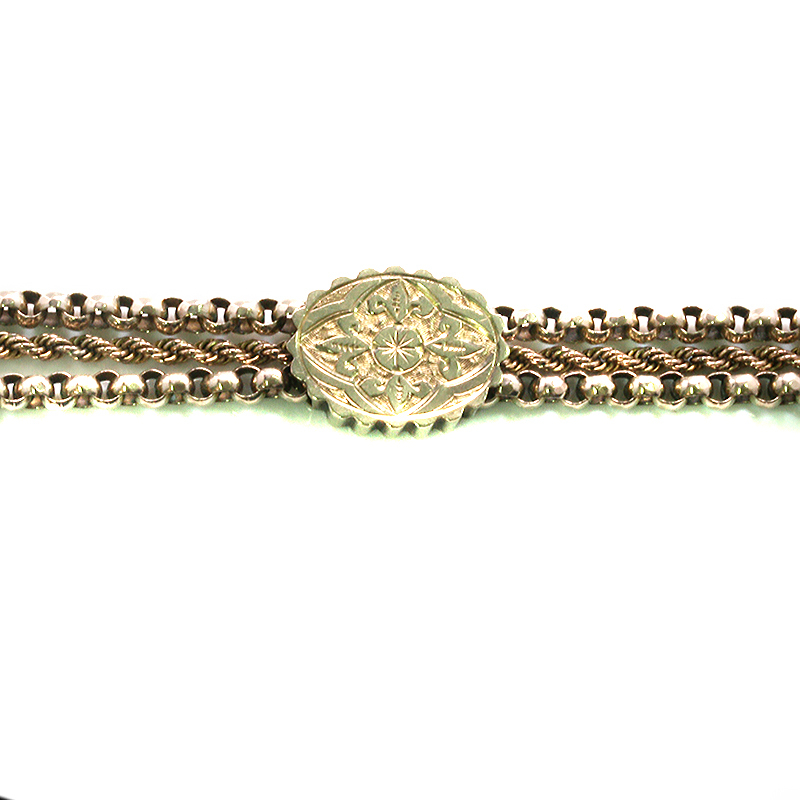 Made with three rows of chain, the centre row is a twisted rope link and the outer chains are belcher links and in the centre is a beautiful hand engraved slide. At each end is a swivel clip and fox tail link tassel which itself is just so beautiful and tactile. Laid out it measures 26.5cm or connecting it as a bracelet around 22cm and the link to attach the swivel to can be drawn further in if need be. So elegant and regal, this antique Albertina is just lovely and feminine and will always be admired no matter if it is worn as a bracelet, necklace or to hold a ladies fob watch.